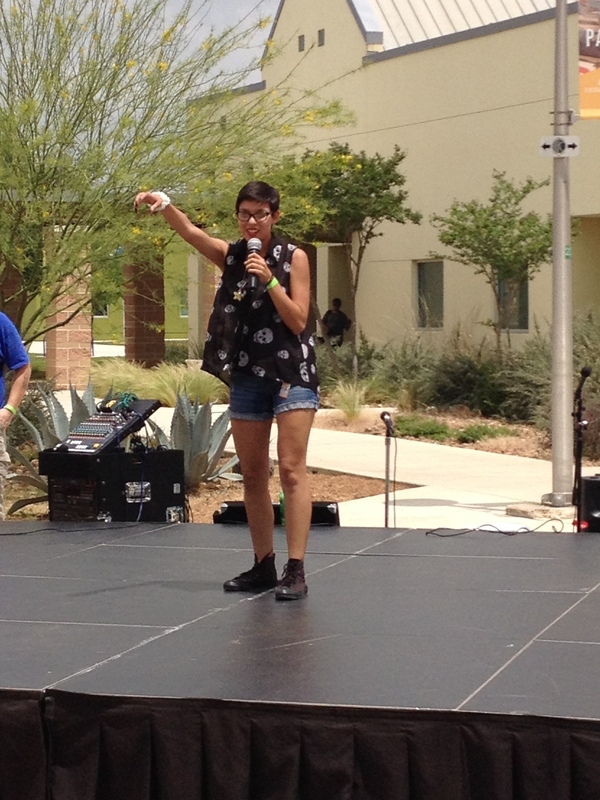 Ariel Aguirre performs “Alone Together” by Fall Out Boy at PACfest 2014. Students at Palo Alto showed up and showed out at the Second Annual PAC’s Got Talent contest on Monday, April 7, at noon in the Student Center Annex. The show provided students the platform to broadcast their talent to their peers. The competition overflowed with students, and the talent did not fail to show diversity in genre or presentations, ranging from Hip-Hop dancing to Rock and Roll and Mariachi. “I enjoyed the experience and the organization of the show. There was a good atmosphere,” said sophomore Felix Gonzales, a Logistics major at Palo Alto College. Carmen M. Velasquez, the college’s director of Student Engagement and Retention, credits the time and location changes this year as positive adjustments that increased student participation. Participating in a talent show is not for the fearful; displaying your raw talent for open feedback takes courage. “For them to be able to go up there on stage and show their talent in front of all those students; I’d say they all did an awesome job!” said Velasquez. Open rehearsals took place a week before the final show at the Student Center Annex. A total of 16 acts performed for PAC’s Got Talent, and Dr. Daniel Rodriguez, a counselor and professor at Palo Alto College, served as emcee. First place went to Alyssa De La O for her vocal of “El Toro Relajo;” runner up was awarded to the Forever Selena group, who performed a Hip-Hop Mix dance routine; and third place went to Ariel Aguirre for her rendition of “Save Rock and Roll”. “I loved Ariel. I really loved that song, and I think she did really great on it,” said sophomore Cheyenne Krippendorf, an Education major at Palo Alto College. For the PAC’s Got Talent winners, the prize included performing at PACfest 2014 and $50 worth of tickets to use at the event. De La O, a junior Communications major, said she likes singing as a hobby, and she has been performing for 7 years now. This was her second year at PAC’s Got Talent. “This is my last year at Palo Alto, and I wanted to get involved,” she said. De La O has been invited to perform the national anthem at Palo Alto College’s graduation on May 17. Winners of PAC’s Got Talent appeared at PACfest 2014 from 1 p.m. to 2 p.m. on the second stage. PACfest 2014 is a free, annual, official Fiesta event sponsored by the college. For more information on student activities, please contact the Student Engagement and Retention Office located in the Student Center, Room 124, or call (210) 486-3125. If you missed the event, you may watch the performances from this year’s PAC’s Got Talent 2014 and last year’s PAC’s Got Talent 2013 on YouTube.